Can you name the twelve apostles? What about the six noble gases? The ten sports of the modern decathlon? The twelve signs of the zodiac? Santa's eight reindeer? 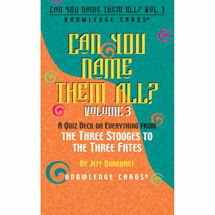 Culled from many different genres - including science, history, pop culture, and literature - the questions on these knowledge cards will give your brain a workout! 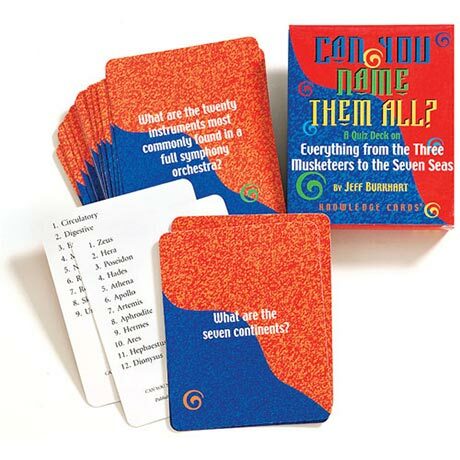 (Flip the card over for the answer.) 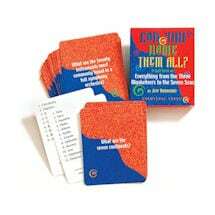 Use the boxed set of forty-eight 3 1/2" x 4" cards to quiz yourself, or make it into a competition with friends. See Volume Two and Volume Three here. Buy 3, save 10%! Buy 5, save 15%! Buy 10, save 20%!